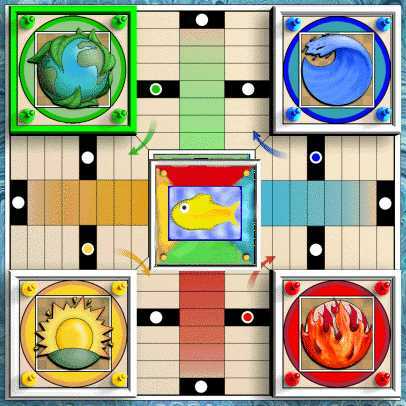 Pachisi is a complex 'cross-and-circle' race board game1. It is a four-player game played on a distinctive cruciform board. It is a skill-demanding partnership game. Pachisi is played with binary lots in the form of cowrie shells. Pachisi is also known as 'Twenty-Five' (the Hindu word pachis means "twenty-five"). This is because twenty-five is the highest possible throw in Pachisi. It is believed that both Pachisi and Chaupar were created around the 4th century A.D. in India2. It has been described as India's national board game3. After Chess, many says it is the most important game who has originated in India. It is difficult to separate it's history from the related board game Chaupar who most probably is either a ancestor of Pachisi or developed alongside Pachisi in the same timeframe4. Pachisi was called "the poor man's Chaupar". This partly since cowries (the playing pieces in Pachisi) were used as currency by the poorer Indian classes and partly because Chaupar is a more complex game and therefore regarded as more aristocratic. Today both games are regarded as folk games and trivial pastime. Pachisi (and Chaupar) might be ancient and very old games. But nothing is certain about it's age. There is no firm evidence of either games claimed antiquity2. 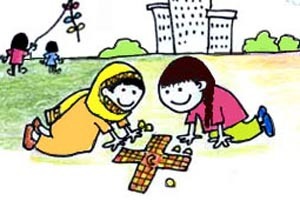 One point that must be stressed again and again is that Pachisi is played in partnership5, requiring co-operative rather than individual play. If you rush your pieces home before your partner, the opponent will set up blockades or make repeated captures of your partners pieces. This is because the opponent then will have two throws against your partners one. According to Parlett (1999, p. 45) the element of blockading in Pachisi is questionable. The feature only appears in some western sources of doubtful authenticity. It might be a later addition to the game. Pachisi is a game for four players, usually in two teams. One team has yellow and black pieces; the other team has red and green ones. The winners are those two people who both get their pieces to the finish first. Each player has four beehive-shaped pieces. The pieces of one player are distinguishable from another by their colour: black, green, red and yellow are used for each player. 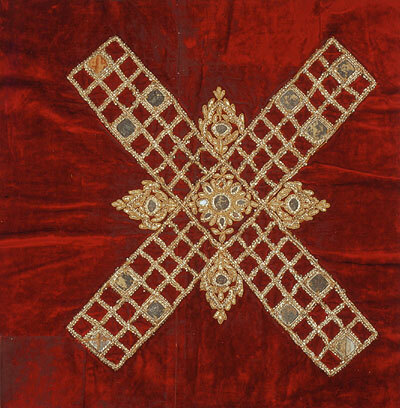 The board is usually embroidered on cloth. The playing area is shaped like a cross. There is a large square in the centre, called the Charkoni, which is the starting and finishing position of the pieces. The four arms are divided into three columns of eight squares. The players' pieces are moved along these columns of squares during play. Twelve squares are specially marked as castle squares. Four of these are positioned at the end of the middle columns of each arm; the other eight are four squares inwards from the end of the outer columns on each arm. A piece may not be captured by an opponent while it lies on a castle square. Each player's objective is to move all four of their pieces completely around the board, anticlockwise, before their opponents do. The pieces start and finish on the Charkoni. The playing order6 is decided by each player throwing the cowries. The player with the highest score starts, and turns continue anticlockwise around the board. Each player's first piece may leave the Charkoni on any throw. Each player moves their pieces down the centre column of their own arm of the board, then anticlockwise around the outside columns. A player may have any number of their pieces on the board at one time. One piece only may be moved with a single throw, or if the player chooses, they can decline to move any piece on a throw. If a 6, 10 or 25 is thrown, the player gets a grace. This enables them to introduce another of their pieces from the Charkoni onto the board, and they also get to repeat their turn. More than one piece of the same team may occupy a single square. However a piece may not move onto a castle square that is already occupied by an opponent's piece. If a piece lands on a square (other than a castle square) occupied by any number of the opponent's pieces, those pieces are captured and must return to the Charkoni. Captured pieces may only enter the game again with a grace throw. A player making a capture is allowed another turn. A piece completes its trip around the board by moving back up its central column. Returning pieces may be placed on their side in order to distinguish them from pieces that have just entered. A piece can only return to the Charkoni by a direct throw. Four of the castle squares are placed so that they are exactly 25 moves from the Charkoni. A common strategy is for returning pieces to stay on these squares, where they are safe from capture, until a 25 is thrown. Then they can finish the game directly. This is where the name of the game comes form. 2. Parlett, 1999 p. 43. Parlett says: "A first-millennium origin for Pachisi or Chaupar seems plausible". See also note 1 in the Chaupar page. 4. It was Chaupar, not Pachisi, who was played "live" with sixteen-slave-girls in the courts of Emperor Akbar (1542-1605). All references on the net to the "Pachisi courtyards" are wrong. See also the page for Chaupar. 6. Unknown source. According to Saunders (1995, 26, p. 570) no sources says which player starts the game (either in Pachisi or Chaupar).